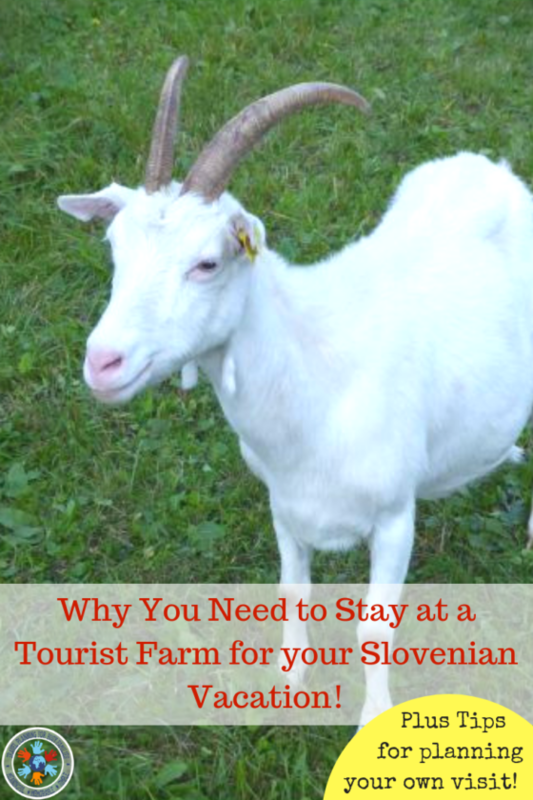 What is it like to stay on one of the many tourist farms in Slovenia? Imagine staying in breathtaking rural farm surroundings. Your beautiful apartment or room is well equipped with everything that you might need. Outside, the kids have plenty of room to run around and a playground to explore. After eating a fresh from the farm, homemade breakfast you get to know the farm animals with the kiddos or head out sightseeing in the epic Slovenian countryside. This is a delicious picture of life on a Slovenia tourist farm. A tourist farm is usually a working farm which offers accommodation and often breakfast and sometimes options for other meals. There is an amazing network of Slovenia tourist farms throughout the country. 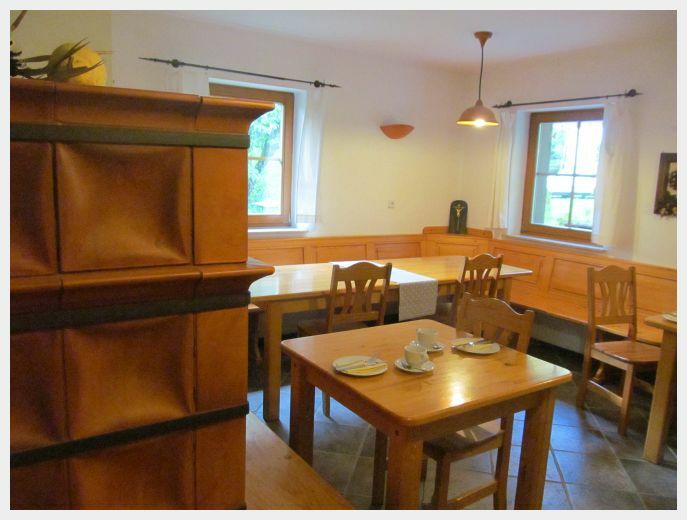 I am confident that these are some of the best places to stay in Slovenia. The opportunity to experience rural life in Slovenia in this way and to be taken care of like family by our amazing hosts was a big part of why we chose a Slovenia farm stay. 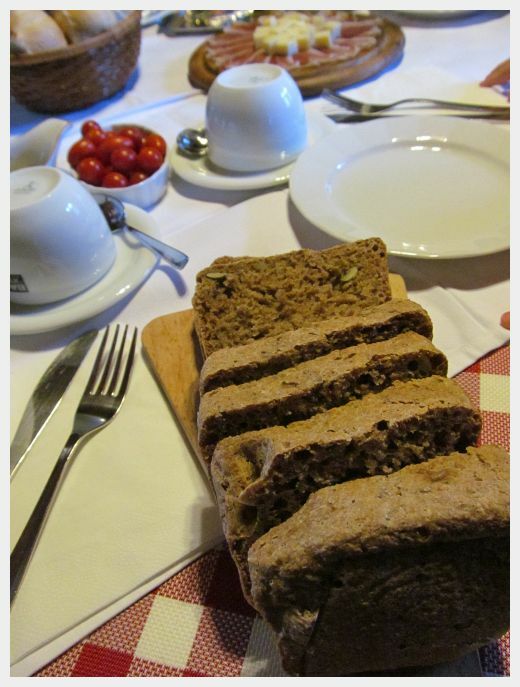 Many tourist farms in Slovenia offer farm fresh breakfasts and some offer the option of dinner as well. 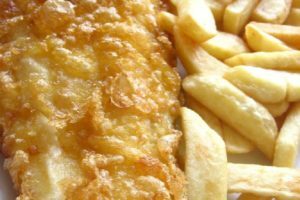 The food that we ate at our tourist farms was some of the best that we had on the trip, and the value for these meals was better than any restaurant that we ate in. If you have kids, staying at a Slovenia tourist farm is great because unlike many hotels or apartments, there is generally plenty of outdoor space for the to run around and explore and often farm animals for them to meet. You may even be able to participate in doing chores on the farm to give your kids a different perspective. A deeper immersion in local culture and traditions than you would get staying in more traditional Slovenia accommodations. We loved learning about Slovenia’s deep agricultural heritage and the kids got a hands on feel for what life is like on a farm. It was really incredible to see how common it is for multiple generations to live and work together on these farms. Many tourist farms in Slovenia have a deep history going back generations which you will learn about if you stay. 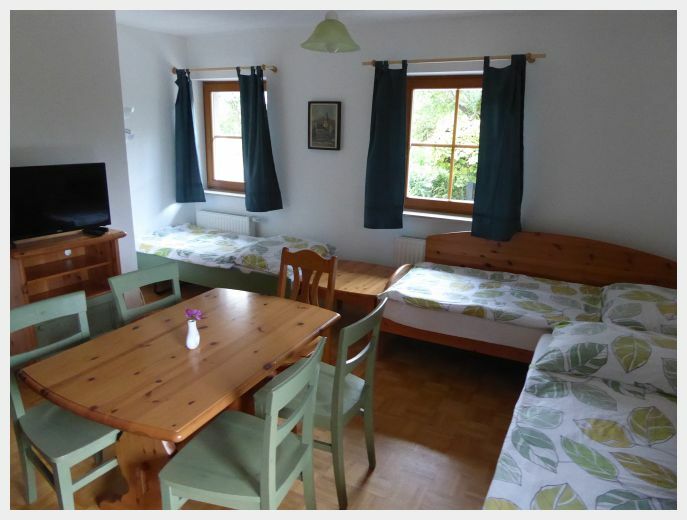 There are MANY tourist farms in Slovenia that offer rooms with one queen or double bed. Room or apartments in a farm stay that can accommodate a different bed configuration or a larger family are less common. Book early for best choice. Plan to spend a minimum of 2-3 nights in each tourist farm. This is the minimum amount of time that you should take to immerse yourself in the farm experience and get the most out of it. 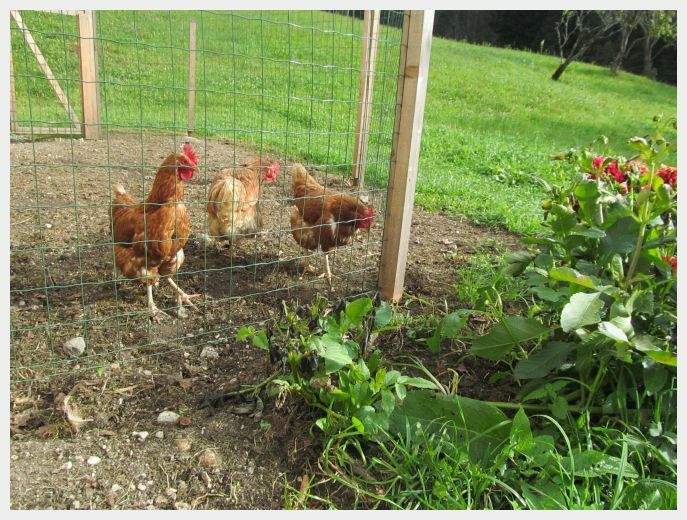 As a bonus, many Slovenia tourist farms offer a discount for a longer stay. Book direct. I always got better rates or better amenities booking directly through the farm stay than through a third party website. I love to read Tripadvisor reviews for the places that we are thinking of staying. Read over reviews to learn about the particular nuances and unique features of the farm stays that you are considering to help you make your decision. 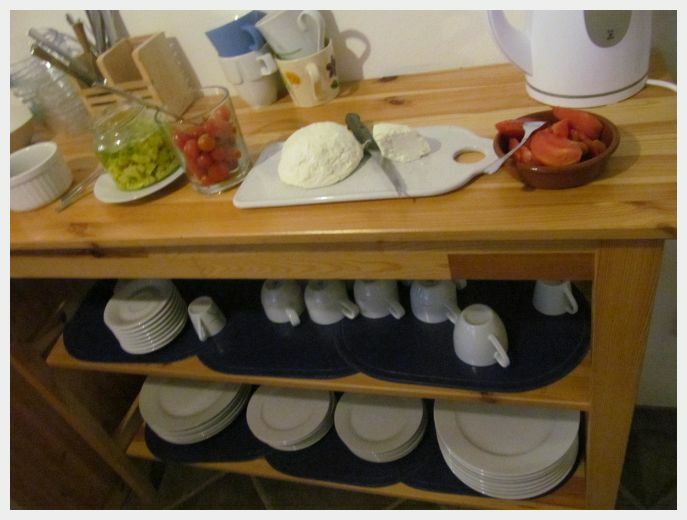 Most farm stays offered the option for “half board” which generally includes the room plus breakfast. If your farm stay offers “full board”, you might have the option of adding dinner on. 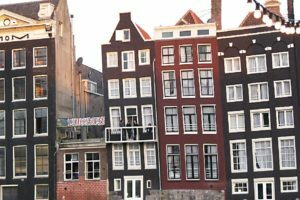 When we booked self catering apartments with kitchens, breakfast was sometimes an additional charge (typically 5-7 euros/person, kids free or half price). 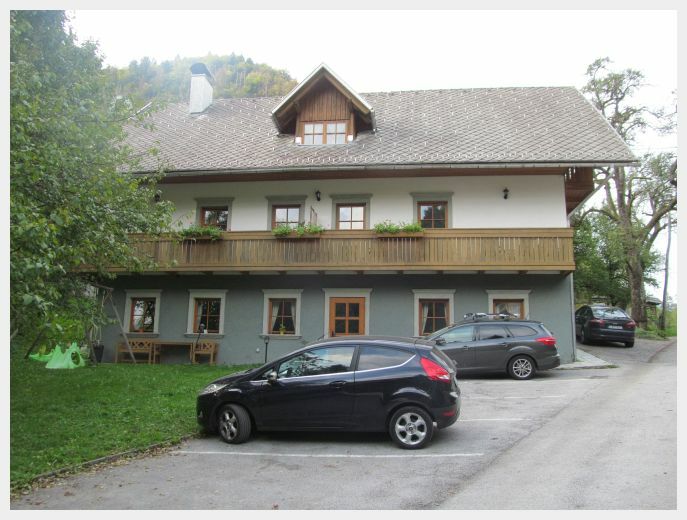 All of the Slovenia farm stays that we booked required a deposit ahead of time. This is understandable given that these are small, family run operations with limited rooms available. This is a little different than what most westerners are used to when booking hotels. Many tourist farms in Slovenia do not accept credit cards, so these deposits will need to be made by bank transfer. After researching, I found that Western Union was the easiest way to do this online (if needed, the tourist farm will provide you with the numbers that you need to make the transfer). Time moves more slowly in Slovenia. 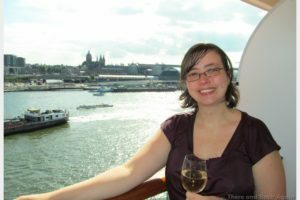 Every one of the e-mails that I sent to the tourist farms that we stayed at in Slovenia before our trip was answered accurately and completely, but sometimes it took a few days. These folks are busy with the chores of running a working farm AND accommodating guests. Be patient if communication is slower than usual for US standards. Most of our farm stays requested payment in cash, so plan your cash flow during your trip accordingly. Tourist Farm Dolinar Krainer is centrally located up in the hills in a small village between Lake Bled and Lake Bohinj. 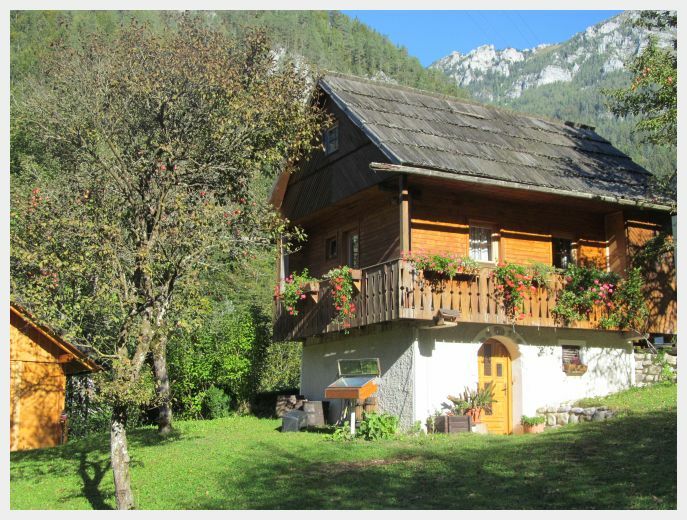 If you are looking for accommodation in Bled Slovenia, I highly suggest this farm stay. We were less than 10 minutes from Lake Bled, but being out of the busyness of the main area of Bled Slovenia hotels area was a welcome respite to our busy days of sight seeing. The road up to the tourist farm was narrow and windy, but the views from the top and from the village were captivating. This area of Slovenia has a lot to see and do, so we stayed here for six nights of our trip. The apartment that we booked for 3 adults and two children fit our needs perfectly. It had one bedroom with one queen bed and three single beds around the edge of a dining room/kitchen. Highlights of our apartment were a nicely stocked kitchen, a lovely little balcony and heated bathroom floors. Our apartment at Farm Stay Dolinar Krainer had two bedrooms and was perfect for our family of five. 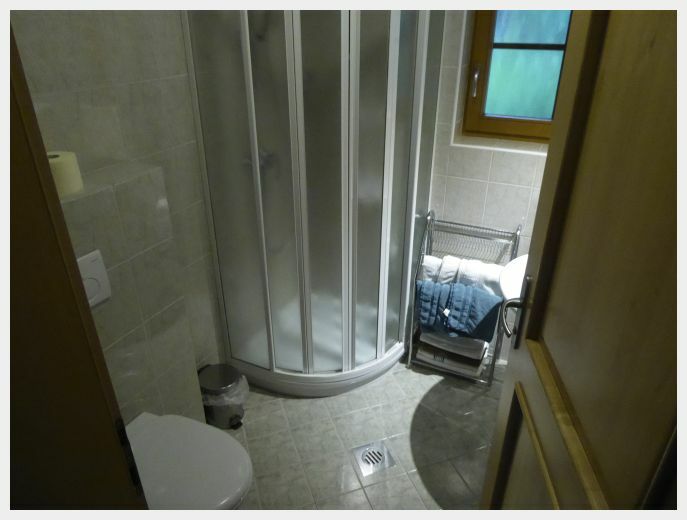 Our beautiful, large bathroom at Farmstay Dolinar Krainer…it even had heated floors! The best part of our stay was being taken care of by Isa, the lady of the house. 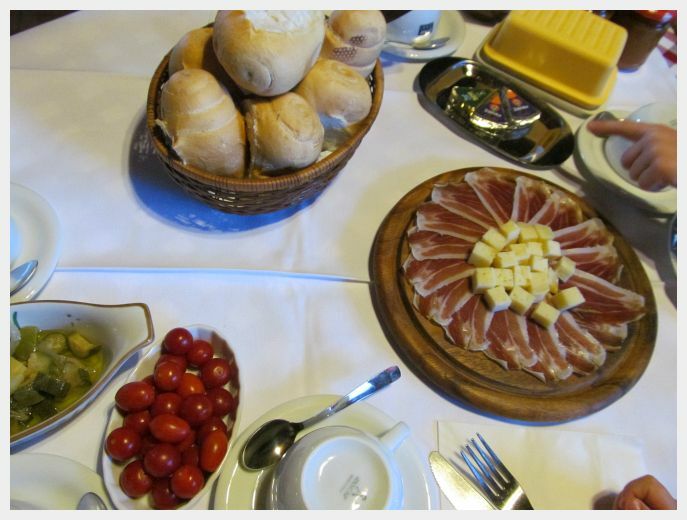 We indulged on her breakfast each day which included freshly baked breads, local prosciutto ham and cheese, local eggs and farm made goat cheese. Yum. The dinner she cooked us on one lucky night of our stay was made from scratch and substantial. The dining room at Farm Stay Dolinar Krainer was where we were spoiled for six mornings and an evening with amazing, farm fresh food. 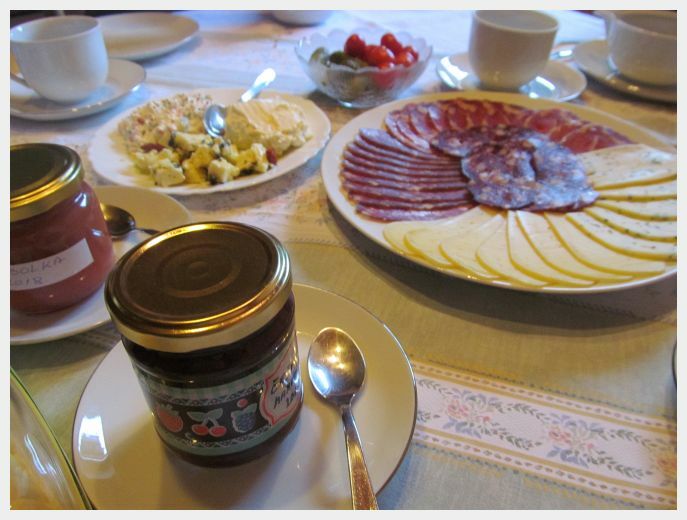 The breakfast at Farm Stay Dolinar Krainer was organic, farm fresh and AMAZING! Isa happily invited us and the kids to the pasture with her to see the goats. The kids were excited to come back and see how the goats were milked, but the wily goats had escaped their pasture that night and Isa did not find them until well after dark. Next time. This was a lovely introduction to Slovenian hospitality and a great way to start our trip. Tourist Farm Ramsak was a little off the beaten path, but in a nice way. It is located near the epic Solcava Panoramic Road and the Logar Valley. Our beautiful cabin at Tourist Farm Ramksak near the Logar Valley. This was one of the best tourist farms in Slovenia in an amazing location. 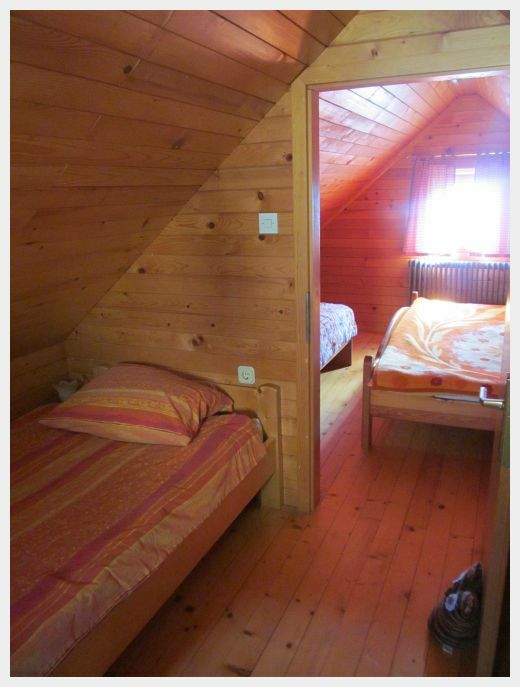 We stayed here for three nights in cozy separate apartment that looked like a little mini chalet. The views of the mountains from the wrap around balcony were amazing. I sat out on the balcony one night wrapped up in a blanket just enjoying the peace and stars while watching the moon come up. Our lovely little apartment had one queen bed and three singles in two separate rooms. There was one twin bed and the queen in the back bedroom. We slept with both kids in the back bedroom which closed with a door. The two singles in the front bedroom were too close to steep stairs for our comfort with the kids. Our cozy bedroom at Tourist Farm Ramsak. The ample kitchen in our apartment at Tourist Farm Ramsak. The downstairs had a nice dining table, a comfy couch with a tv and a well stocked kitchen. The kids enjoyed the trampoline in the yard a lot. They also liked looking at the farm chickens and a special trip down to the trout pond to feed the fish. We ate breakfast in the dining room in the main house each day. We were served freshly baked bread, fresh preserves and prosciutto ham with local cheese and freshly made yogurt from their cows’ milk. Home cooked, authentic Slovenian dinner that we enjoyed at Tourist Farm Ramsak. This was one of the best dinners that we ate and because we were guests, the cost was super reasonable! We were also offered dinner on two separate nights which we gratefully accepted. 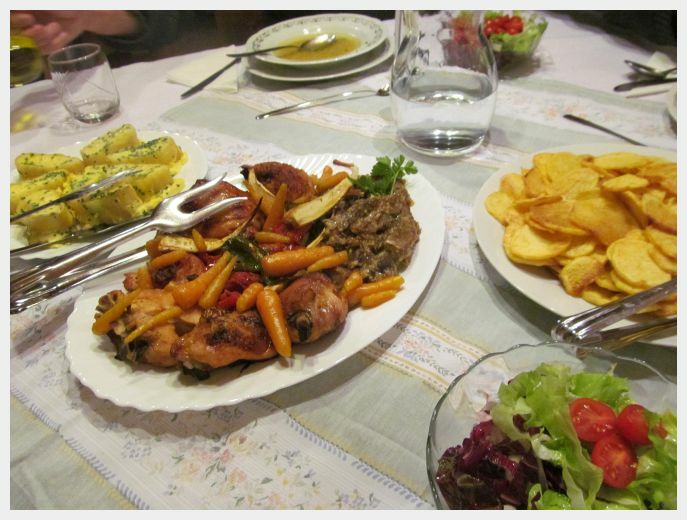 All I can say about these meals is that it was like having a Slovenian grandmother cooking home cooked Slovenian specialties for us from her kitchen and it was wonderful and was a very special part of our trip. Tourist Farm Tonin was the last of our three Slovenia tourist farms. 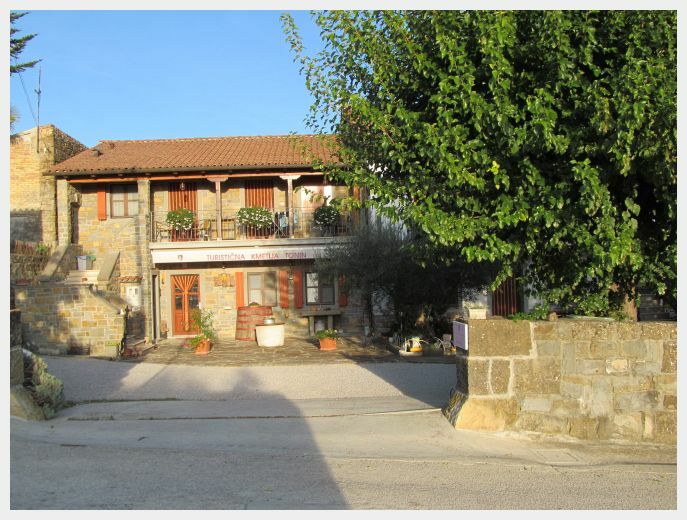 If you are looking into Piran hotels but want to stay a little outside of the big city, Tourist Farm Tonin was as ideal choice. We got the best of both worlds here – a small Istrian village just a short drive away from beautiful Piran. Tourist Farm Tonin is on the edge of a lovely little Istrian village called Puce in the south western portion of Slovenia. The views from this village of the surrounding countryside were breathtaking. I thought that we were in the Italian countryside! This Slovenia tourist farm was completely lovely and entirely different in character from the mountainous farms that we had come from. 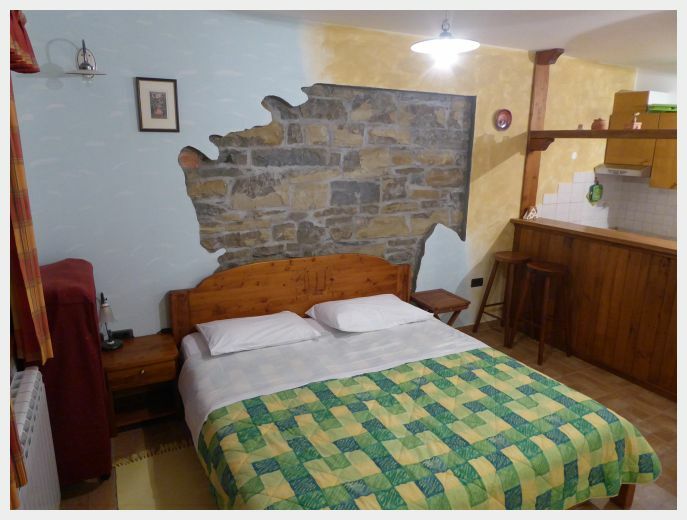 The two apartments that make up the accommodations are housed in a traditional stone farm house. There is a little terrace in front and the windows in our room looked out over the backyard and the farm’s extensive olive plantings. Upon check in, we were welcomed with wine and spirits made on the farm. We indulged in homemade breakfast each day in the rustic and cozy dining room downstairs. Breakfast featured the farm’s home made olive oil, homemade breads including the most wonderful dark spelt bread that I have ever had, as well as fresh juice and locally made prosciutto that melted in my mouth. 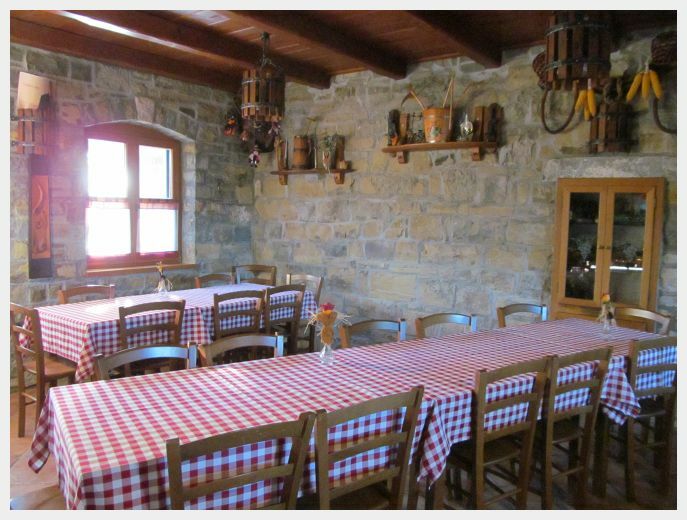 The beautiful dining room at Tourist Farm Tonin where we enjoyed three more truly lovely breakfasts. Breakfast at this tourist farm included this AMAZING dark spelt bread, fresh olive oils and the most succulent prosciutto that I have ever tasted. They only offer dinner for larger groups, but we found a really wonderful restaurant in a nearby village (it was a little bit of a splurge, but this was one of the best meals that I have ever eaten ANYWHERE). Our rooms were clean and entirely adequate. They each had one queen sized bed and a fold down couch. 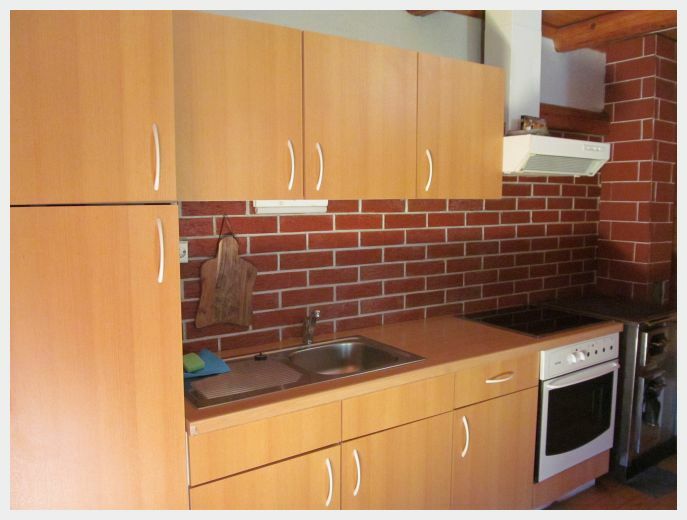 They had a well equipped kitchenette with a stove top, fridge, sink and microwave as well as a dining table. One of two lovely apartments at Tourist Farm Tonin. They each had a queen bed, fold down sofa and kitchenette. We rented both and had the whole place to ourselves! The kids had a great time playing in the farm’s large backyard. There was a small swing set as well as a pen with donkeys and other farm animals that the kids really enjoyed. It was an easy place to enjoy our last few days in Slovenia. We left well fed and happy with as much of the farm’s home made olive oil as we could fit in our suitcase.